The Episode starts with Anurag going to receive Prerna. 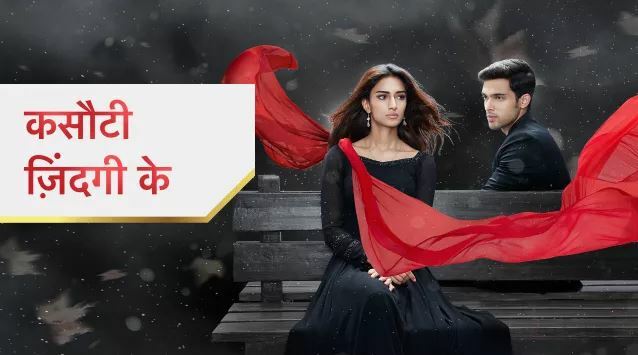 Komolika sees him rushing to Prerna. She says Prerna is surely Mishka’s Sautan. Anurag says you guys got late, I was waiting for you, where is Dadi. Rajesh says she has gone to village. Veena says we didn’t know about your engagement. Prerna sees Mishka and thinks I really got late. Komolika asks Mishka to see Prerna. Mishka says she is still glued to my Anurag. Nivedita asks Mishka to come for the engagement, so that Anurag doesn’t think about someone else, I know I didn’t tell you the truth before, Prerna’s love is one sided, it will end with your engagement, I m with you, okay. Komolika says you think like me to some extent, we are going to be good friends. Moloy asks Shivani how is she now. Veena says Anurag has explained Shivani well, everything is fine now. Anurag and Prerna think of each other’s words and moments. Komolika says Mishka you have one quality like me, possessiveness, Prerna will be with Anurag, I have a plan, I have to plan to make Prerna leave from the party. She tells the plan to Mishka. Veena congratulates Mishka. Mishka makes the waiter fall down. She scolds him for spoiling Prerna’s saree. Prerna says its fine, I will manage. Komolika smiles. Prerna goes to clean her saree. Nivedita asks for a good mahurat for engagement. Pandit asks why did Mohini decide suddenly, the mahurat isn’t good for engagement. Nivedita asks Anurag to go and get engagement ring, pandit will do its puja. He goes. She asks about the mahurat. She says get them engaged if mahurat is good. Anurag goes upstairs. Moloy asks Anurag about his friend. Anurag says I spoke to him, the matter is resolved. Moloy says no, please tell him that he is in love. Anurag looks at him and goes. Rajesh comes. Moloy says Anurag is in love with someone else. Rajesh asks what, he would have told you. Moloy says he doesn’t know he is in love, he is confused. Rajesh says its nothing like that, come. Moloy says no, he is really in love. Anupam hears them. Prerna says sorry, I had come to use your washroom, guest washroom was busy. Anurag says its okay, don’t be formal. We are friends. She says yes, but you will be getting engaged to Mishka soon. She gets leaving. He calls her out and stops her. Deewani hogai…plays… He reminds her the story of thornbird. She says when thornbird gets her love, she goes to sit on a thorn while singing, so that her love turns eternal, why is love so painful. He says no, its beautiful. She asks why are you talking like me. He says I m influenced by you. Pandit asks Nivedita about the ring. Nivedita asks Mishka about Anurag. Mishka asks about Prerna. Nivedita says she would be crying in some corner. She goes to call Anurag. Prerna picks a file. She realizes something and gets back…. He asks what happened. She says my hook is broken. He says don’t worry, I will get extra hook or safety pin, until then talk to the walls. He goes. He shuts the door and tells Nivedita that he is going to get his engagement ring. Prerna gets his ring and keeps it. He gets some safety pins from Mohini’s room and comes back to his room. He tries to help Prerna. He asks her why is she crying, its just a hook. Pal ek pal….plays… He asks is there any other problem. He gets hurt. She cares for him. They have a moment. Mohini praises Mishka. Chobey says I m also glad that Mishka has chosen a nice guy. Komolika thinks parents talk such boring things. She goes. Her dress gets stuck. She realizes the broken hook and looks in the mirror. She says who will help me, Anurag will help me. She smiles. She says I will embarrass Anurag today, I will ask him to fix the hook of my blouse, should I be doing this, is it right to flirt with him. She asks about Anurag’s room and goes. Anurag says I like your dependency on me, I like helping you, promise me that nothing will change between us. Prerna looks at him. Komolika comes to him and calls him Jiju. Komolika taunts Prerna that her love will sink into her tears. Prerna falls down the stairs. Anurag runs to hold her. He holds her in arms. Anupam says Anurag you are in love with Prerna.